This Cabinet Card presents a bit of a mystery. The photograph is by famed French photographer, P. Nadar of Paris. The subject of the photograph is a mystery. The reverse of the card has the name “Ilbert” written in two places. In addition the word “Chanteuse” also appears. Is she an opera singer? Is she a nightclub singer? The woman is very stylish and is wearing a fur and interesting hair clip. Hopefully, a viewer will leave a comment with some identifying information. 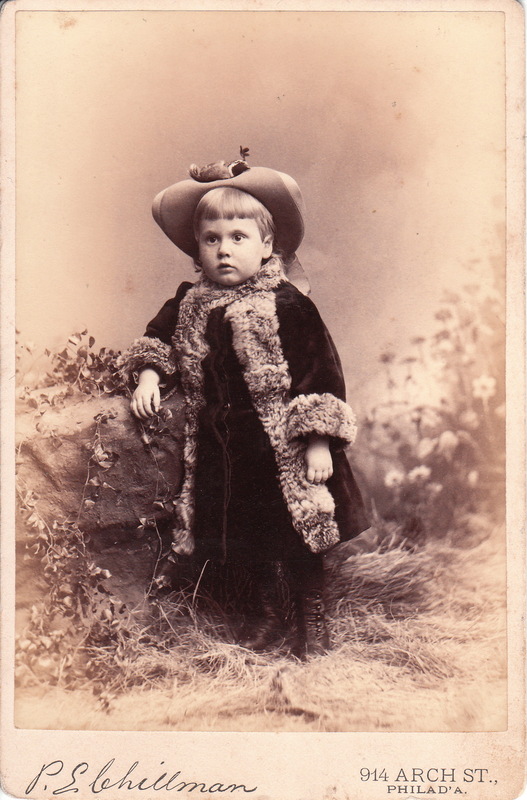 ADDENDUM: This photograph entered into the cabinet card gallery in 2009. Since then there have been a number of cabinet card gallery visitors that have left comments concerning the identity of the subject of this image. There has been some disagreement, but at least two visitors have identified this performer as being Yvette Guilbert (1867-1944). To follow the discussion about identification, check out the comment section below. Now back to Mlle Guilbert. Born as Emma Laure Esther Guilbert, she began singing as a child but worked at a Paris department store model when she turned sixteen. She also took acting and voice lesson and in 1886 she began working as an actress. She debuted at the Variette Theatre in 1888. She was soon singing at a number of popular clubs before starring in Montmartre at the Moulin Rouge in 1890. Over time she began to sing a lot of monologue “patter songs”. Often the lyrics were risque, even raunchy. Her song frequently featured tragedy and poverty. Guilbert was audacious and audiences ate it up. She was celebrated in France, England and the United States. She was a favorite subject of artist Henri de Toulouse-Lautrec, who made many portraits and caricatures of Guilbert. Later in her career, she appeared in silent movies, talkies and made recordings. She also wrote books about the Belle Epoque. It is interesting to note that Nadar, the photographer of the mystery chanteuse also photographed Yvette Guilbert. 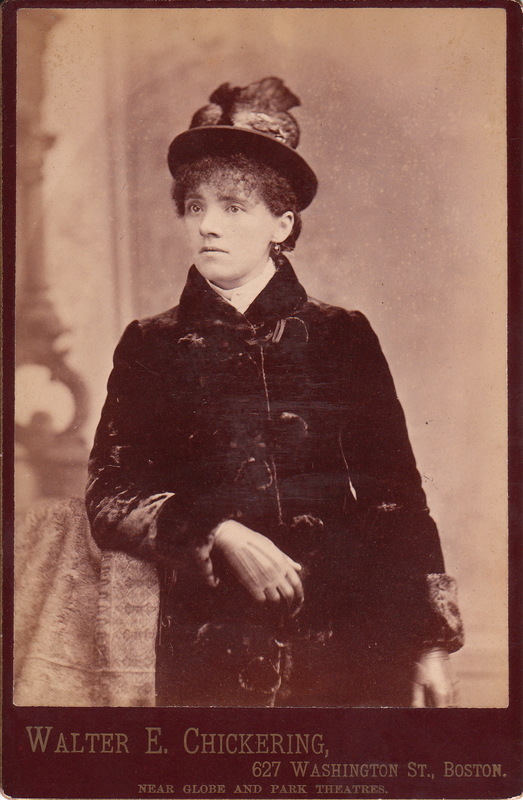 A Nadar photograph of Mlle Guilbert is part of the collection at the National Library of France. A copy of that image can be found below. 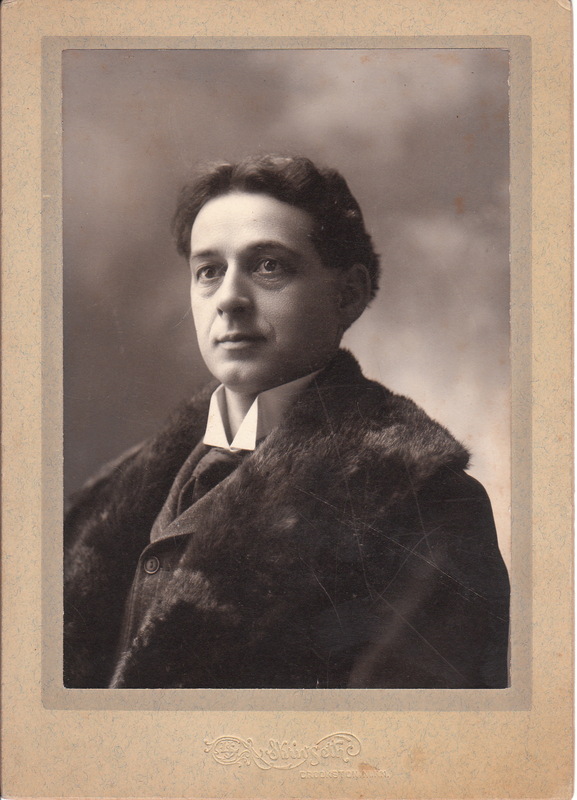 This photograph features a very handsome man posing for his portrait at the studio of Skrin Seth in Crookston, Minnesota. My spelling of the photographer’s name is questionable since his name is partially illegible as printed on the front of the photograph. The subject of this photograph has glamorous looks and is wearing a fur coat. He is identified on the reverse of the card but once again there is a legibility problem. His name is either “Mr. E. McKenzie” or “N. E. McKenzie”. Research revealed no biographical information about the image’s subject or about the photographer. A pretty young woman poses for her portrait at the studio of Walter E. Chickering in Boston, Massachusetts. The woman is wearing a winter coat which appears to be made from fur. Her sleeves are definitely fur trimmed. She is wearing gloves and a lovely hat. The subject of this portrait is unidentified. 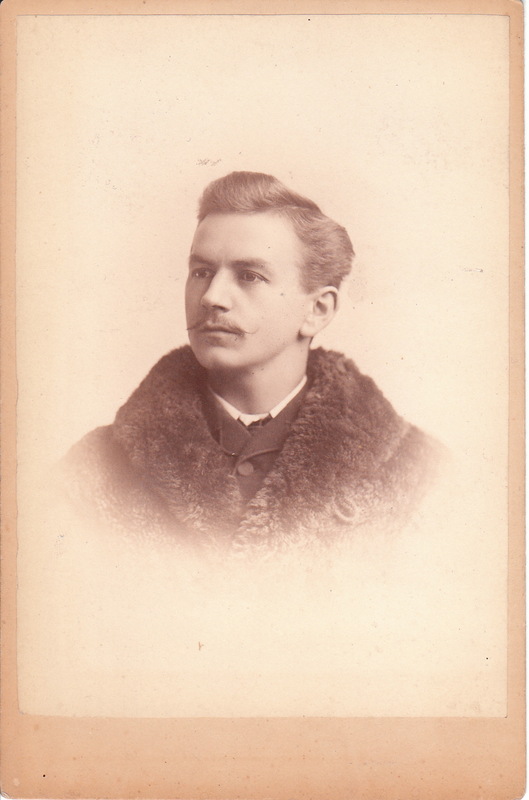 Walter E. Chickering was a well known Boston photographer. He was concerned about being confused with a photographer named Elmer Chickering, who also operated a studio in Boston. The reverse of this image has a printed advertisement describing Walter Chickering as “the original photographer of that name”. The ad is a bit grandiose in its description of Walter Chickering’s studio as being “mammoth” in size. To view other photographs by the Chickering (both Walter and Elmer), and to learn more about them, click on the category “Photographer: Chickering, W.”. 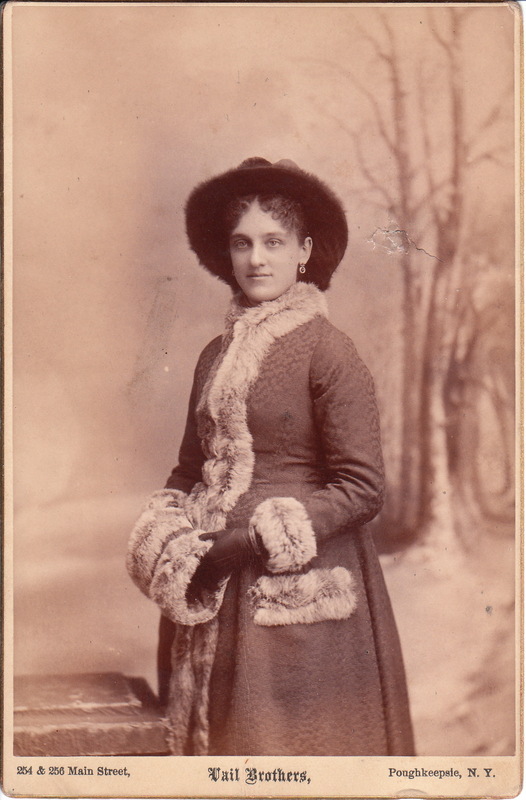 This cabinet card is a portrait of a pretty young woman dressed in winter clothing. Her heavy coat is trimmed with fur and she appears to be wearing a fur hat and leather gloves. The woman can access additional warmth from her fur muff. She is clearly ready for a cold New York winter. The photographic studio that produced this image is Vail Brothers, of Poughkeepsie, New York. Vassar College library’s archive possesses two photographic albums from the photographers. The collection includes photographs of Vassar and Poughkeepsie. Vail Brothers began their studio in 1868 and it was still in existence at least until 1895. The studio is also known for their photographs of a number of the members of the Roosevelt family, including Franklin Roosevelt during his childhood years. A good looking young man, adorned in a fur coat, poses for his portrait. The photographer is J. Fraser Bryce and his studio was located on 107 King Street West, in Toronto, Canada. Bryce was born in 1852 in Dundas, Ontario. After completing his education he went to Toronto and studied photography with Thomas Hunter. He supplemented his training with then acclaimed photographers, C. C. Randall of Detroit, Michigan, and J. F. Ryder of Cleveland, Ohio. In 1884, Bryce located permanently in Toronto buying Hunter’s studio. Bryce is cited in the American Annuals of Photography (1887) as a member of the executive committee of the Photographic Association of Canada. 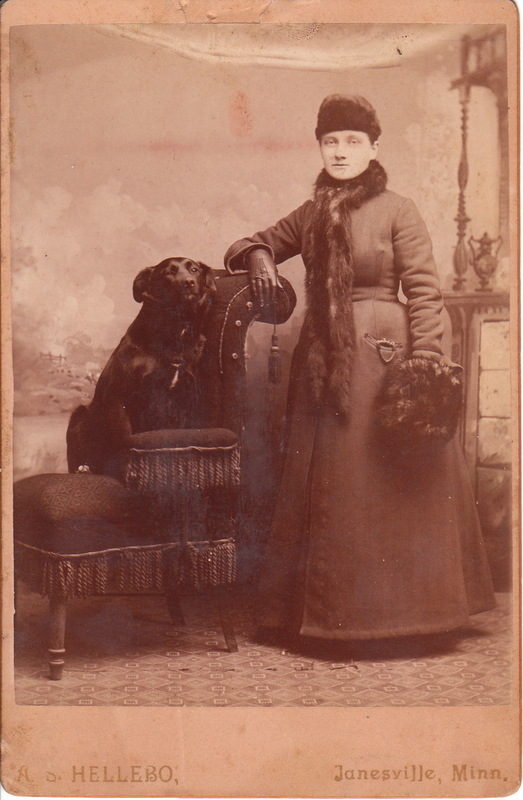 This cabinet card photograph captures a woman and her dog posing in the studio of A. S. Hellebo in Janesville, Minnesota. The woman is wearing a fur hat and fur “scarf”. She is wearing gloves and holding a pocket book. The dog looks like a labrador retriever and appears quite comfortable as it sits on a fancy chair. The photographer, Hellebro emigrated to Minnesota from Norway and some of his photographs can be found in a collection of historical photos at the Minnesota Historical Society.